I wrote this pattern up for the Jamestown Show, Sheep to Hat challenge. The challenge was to shear a sheep, spin it’s fleece and knit a hat. We timed ourselves and I designed the hat to enable five knitters to work on the hat at the same time. We completed the hat in 3 hours and 24 minutes a time to beat next year. The day was a lot of fun, with many of our audience having never seen spinning before! Many thanks to the great team who travelled from as far away as Adelaide and Whyalla to participate. Ally was brave enough to put the unwashed hat upon her head. The hat is now residing in the kitchen at the shop, waiting for next years Show. I had many asking for the pattern so here it is. It would make a great beginners project only needing cast on, knit stitch and knit two together. If using a commercial yarn I would use a 10ply. The pattern could be easily adjusted for a child by using a lighter weight yarn, or by changing the number of stitches in the section. Hat is made in five sections and seamed together. Repeat decrease row until 1 st remains. Using mattress stitch, seam the five pieces together along the long side. 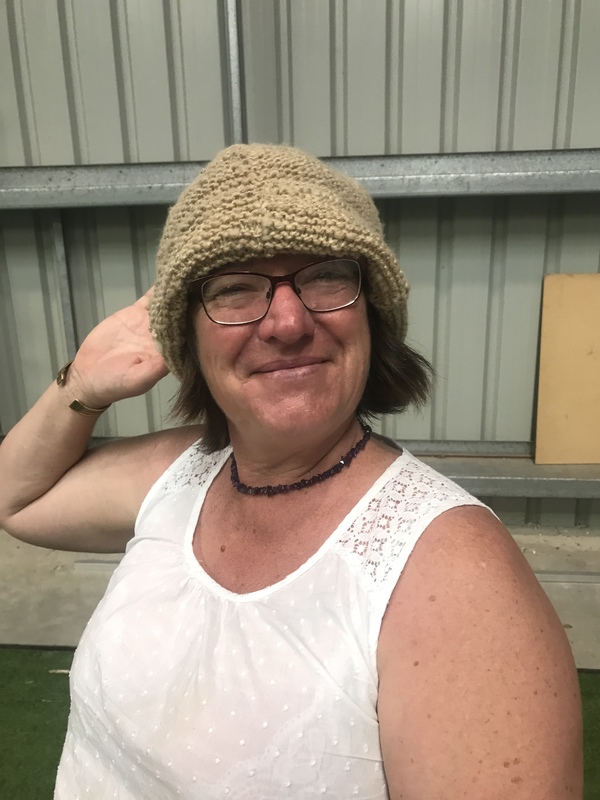 If you do Knit the hat please share the results with me.